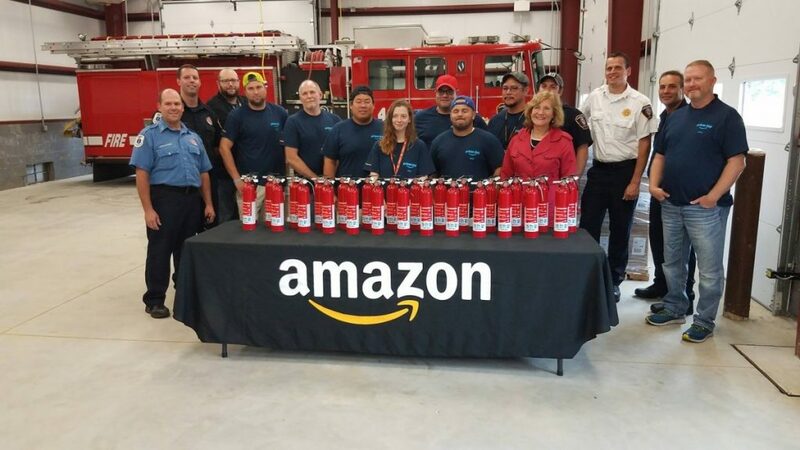 Due to a generous donation from Amazon, the Robbinsville Township Fire Department has a limited supply of fire extinguishers available at no cost to Robbinsville Township residents. Any resident who would like a fire extinguisher is urged to visit the fire station or contact the on duty personnel utilizing the information noted below. Every home should have at least one working fire extinguisher that residents know how to use as part of a comprehensive home fire safety plan. Portable fire extinguishers can save lives and property by extinguishing a small fire or containing it until the fire department arrives. As a general rule, firefighting should be left to professional firefighters. Fire extinguishers are meant for putting out small fires or used to help escape from the area, not firefighting large out-of-control fires. •You know how to use the fire extinguisher and it is the correct type. •Everyone else is leaving the home and someone is calling the fire department. •The fire is small, confined, and not spreading. •You have a clear escape route and will not be overcome by smoke or toxic fumes. If the fire does not go out after using one extinguisher, back out of the area, close the door if possible, and get safely outside and call 9-1-1. Where portable fire extinguishers are installed in the home, follow the manufacturer’s instructions for placement and mounting height. As a general rule, where portable fire extinguishers are installed, a person should not have to travel more than 40 feet to reach one and never have to travel up or down stairs to reach it. If you have portable fire extinguishers, inspect them once a month and have them serviced annually by certified personnel.